Lovely isis faced tabular golden healer hera [self healed] crystal with such clarity that you'll be able to read through even part of its' elestiallated broad side. Rainbows, a light devic veil and many record keepers add to this powerful combination, which also includes glitter and barnacle crystals. 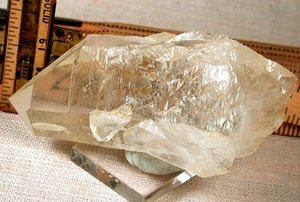 1 3/4x 1 1/8x 3 1/2" tall, this crystal will be a most positive addition to your collection or metaphysical work.